The second stop of our second day was the capital of Goa, Panaji and hence of course Velha Goa. Velha in Portugese means old. Old Goa is also known as Pornnem Goem. Its a historical site in the North Goa district. Our church hopping tour started with the famous Basilica of Bom Jesus. We were privileged to see the exposition of St Francis Xavier which occurs once every 10 years. For the exposition ( which is a huge huge event), there was very tight security and vehicles were not allowed after a certain point. They were providing shuttle buses to the church area from the parking. We parked our bike and then took the bus. It was just a five minute ride and we all were laughing after getting down. The ambiance was very festive with thousands of devotees paying visit. Then as we geared up for taking photos, I remembered something and panicked. Where was our tripod? I was carrying it and could not remember the last time I saw it. No it was not on the bike. So definitely I must have left it in the bus. Gosh now what? There were tens of shuttle buses and their routes were unfamiliar too. I waited there in dismay while poor hubby went hunting for it. I had never misplaced anything before. Losing things is husband's forte. And now that I had encroached his territory, he was going to tease me forever. After 45 minutes he turned up swinging the tripod bag. Relieved, I forgot the bunch of candles which I had bought and left them on the footpath where I had been sitting. The picture of the Basilica could not be taken as it was covered for the huge masses to take place. It was a huge event for which devotees from all over the world had come. The exposition is a 44 day event which started on 22 November. When we had booked our tickets, we did not know that we would be privileged to witness this event which takes place every 10 years for just a few days. The queue to the church where St Xavier's body was kept was very very long. We spent at least an hour waiting but things like this happen once in a lifetime. St Francis Xavier was a Roman catholic who was born in Xavier, Kingdom of Navarre in 1506. He left Rome in 1540 and his goal was to spread Christianity in Asia. He left Lisbon in 1541 and came to Goa, the Portugese capital of India. After India, Japan he wanted to spread his faith in China but died in Shangchuan Island. 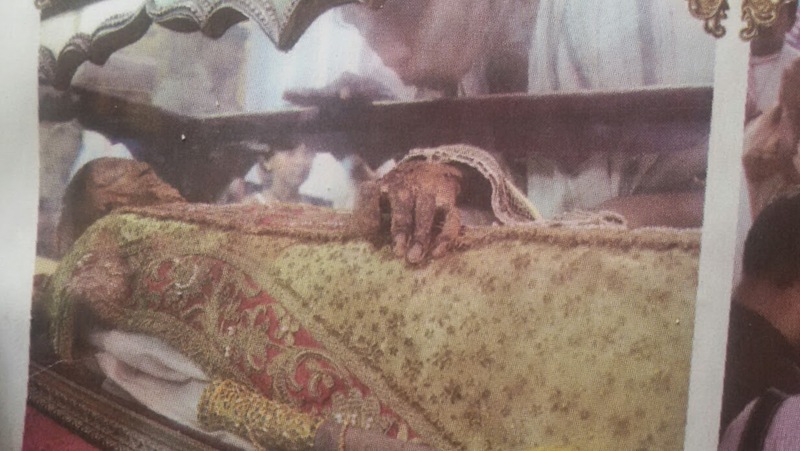 His body was first buried there, then his incorrupt body was taken to Portugese Malacca in March 1553. Later his body was shipped to India in December. 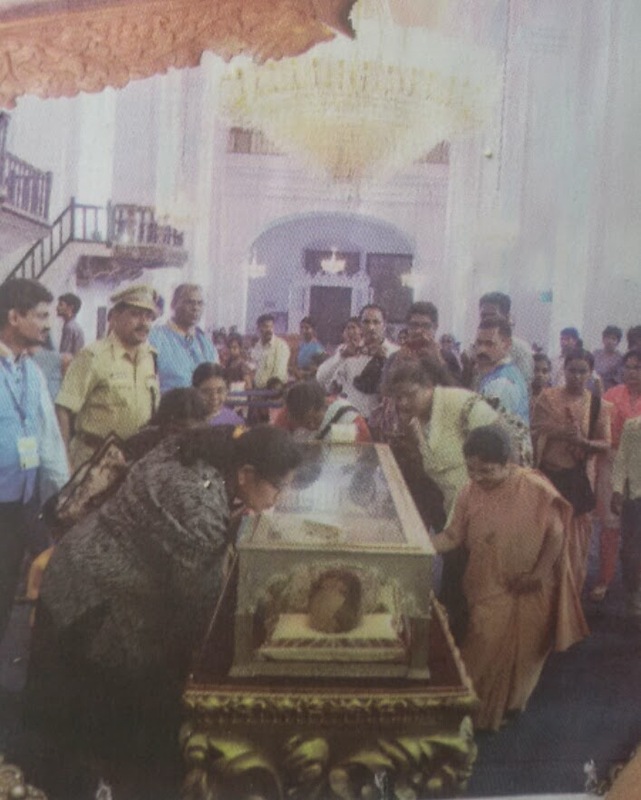 Since then his body is kept in a glass container in a silver casket and known as the Basilica of Bom Jesus. His right forearm with which he used to baptize his converts has been kept in the main Jesuit Church in Rome. 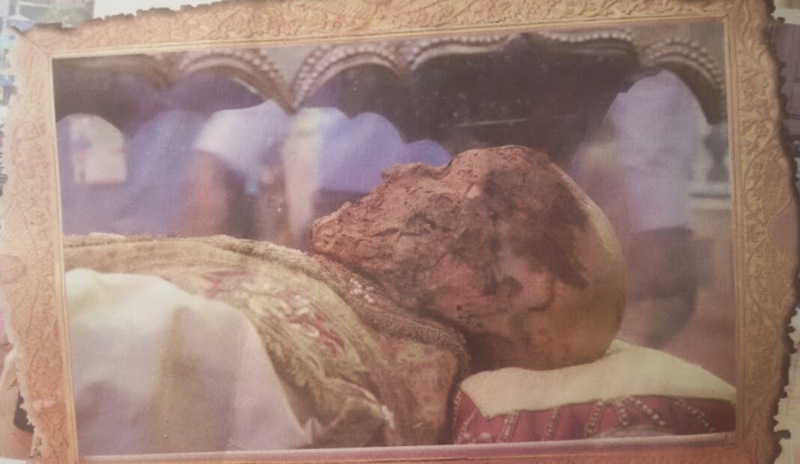 The baffling part is that the body is uncorrupt without any embalming or preservation. Never in my life I thought that I would be able to see his sacred relics. Photography was strictly prohibited inside the church. I have picked these photos from a local newspaper. The place where I realised that I had misplaced our tripod. I had been sitting on the sidewalk crestfallen. At the entrance.. This exposition occurs once in every ten years for just 44 days!! The Se cathedral ..where the sacred relics were kept... We were in the queue for an hour!! In front of the Se Cathedral..
Is a cool place to visit you look amazing in all the images. Very beautiful pics! I like your hat!! The cathedral of St Cajetan is so beautiful! :) lovely photos! Beautiful place!! I love the skirt! The cathedral is gorgeous, I also love your skirt!